All three of us have been LOVING the beach. 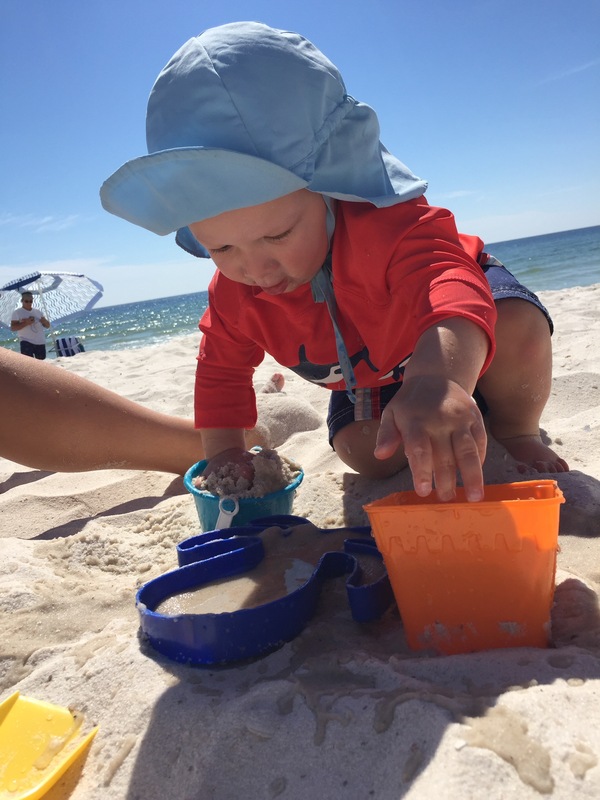 My favorite part of the trip has been watching Henry’s joy at playing in the sand and the ocean. We have been having a blast playing with beach toys, wading into the ocean, and bringing picnics down to enjoy under the umbrella. Henry only occasionally tries to eat sand and seashells, so I consider that a win! The first few days we were in Orange Beach, John’s parents were here. We had a lovely time with Nana and Pop. We had “Henry’s Birthday Celebration: Part One” with them on Saturday. 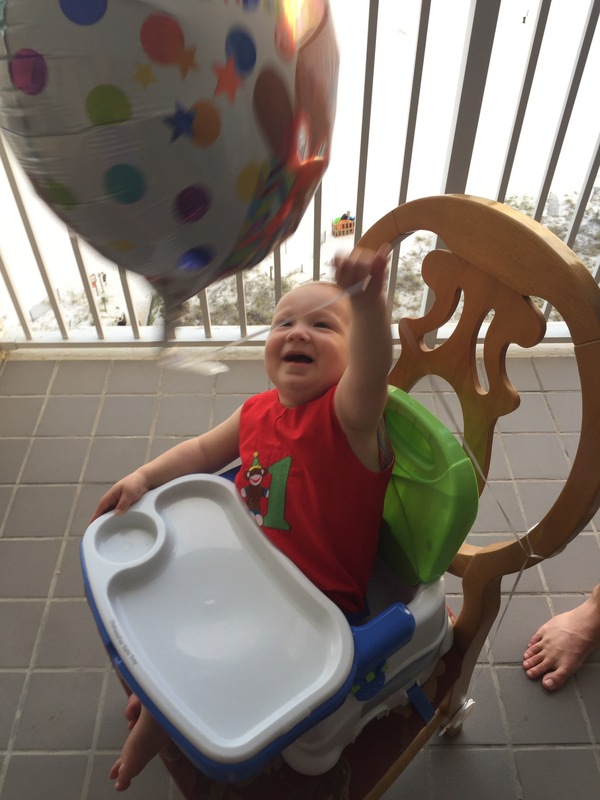 Henry got some awesome gifts, smashed a cupcake, and played with his Birthday balloon. What fun! Today is our last day in Orange Beach before we head over to Florida to spend the weekend with my parents. I can’t wait to celebrate our one-year-old boy on Saturday! This past weekend John, Henry and I traveled to Memphis for my sister, Elizabeth’s, wedding to Patton. It was a beautiful weekend. I can’t believe Elizabeth and Patton are married! I am beyond thrilled. Our grandfather, Henry Strock, performed the wedding ceremony. It was beyond lovely. His homily spoke to my heart and brought me closer to God. What a blessing! Elizabeth was the most beautiful bride I have ever seen! Every part of the weekend was such a sweet celebration of her and Patton. The bridesmaids luncheon was so honoring to Elizabeth and the women who have loved her so well, the rehearsal and rehearsal dinner were lovely, and the wedding was a blast! I can’t wait to see all the pictures from the weekend. In the meantime here are a few I took. It was such a happy day! I can’t help but share these pictures of Henry as well. Is he not to die for in his wedding outfit? He was such a trooper throughout all the wedding festivities. I was such a proud mama! While looking through pictures of this past year to make a photo album, I had two thoughts. First, “Wow, Henry has so much hair now!” And second, “I really miss blogging.” It is such a fun way to keep track of and share what our family is doing. Therefore, we are back! Henry is HUGE. And old. He is 11 months as of last week. John had an easy month during the month of August. We were able to have a lot of family time. It was such a blessing. We may not all be smiling, but at least we are all looking. Right?! This summer was hot in North Carolina. We enjoyed lots of pool time at the pool in our neighborhood. We had some fun visitors this summer. Nana, Pop, and Uncle Andrew spent some time with us in May and August, Uncle Hugh came in June, and Aunt Libby and Uncle Patton came in August. We also made a few trips to Memphis to visit Gran and Grandaddy. 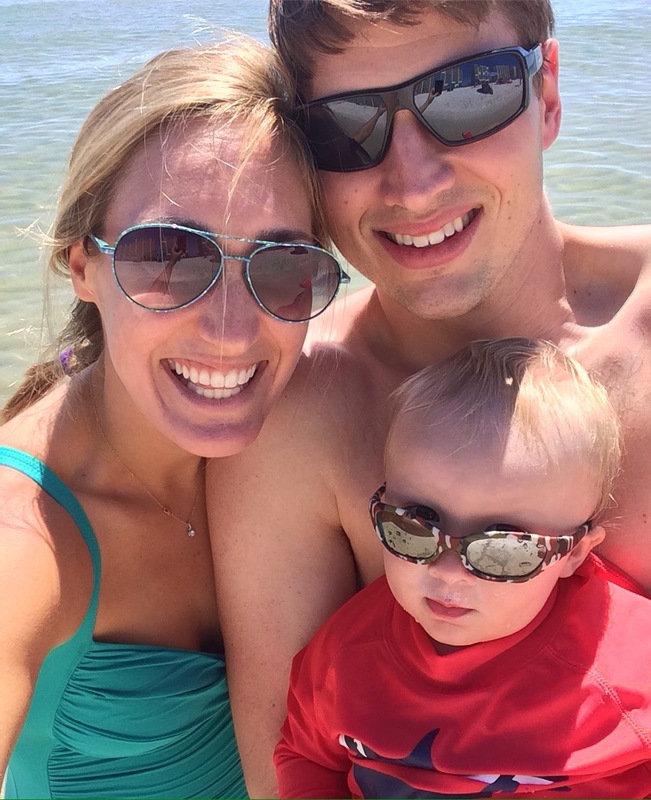 In August, we visited all of John’s grandparents in Summerville, SC and Carolina Shores, NC. What fun! I have kept up the monthly pictures. One thing is for sure, if I do these with the next baby, I will definitely use stickers. It’s gotten harder and harder to wrangle this active boy, while making sure the card can be seen. This makes for some silly pictures. Here are months 6-10. I haven’t taken his 11 month pictures yet. We have also been enjoying the beautiful spring weather with lots of runs and long walks. Henry is now big enough to be in the front of the stroller (instead of in the carseat attached to the stroller), which takes off a lot of weight. This has made running much more enjoyable for me. This past weekend Henry, Lucy, and I went for a long run in our neighborhood. I have really gotten back into running the past couple of months and it feels great. To me, there is nothing quite like the feeling after a good long run. Here are some pictures from Easter Sunday. John had the day off and we had a wonderful day as a family. We went to church together, had some friends over for lunch, and enjoyed a lazy Sunday afternoon. This afternoon Henry and I are going to hike along the Haw River with some friends. Chapel Hill has so many cool spots to enjoy being outside. It is one of the many things I love about living here! We have had lots of fun things going on in the Eick household lately! Henry turned 5 months a couple of weeks ago! We were on vacation when the official day came around so I took his pictures about a week later. What a cutie! He is loving most fruits and vegetables we feed him, his jumper, playing with his mom and dad (he thinks John is hilarious), reaching for toys, and tummy-time! I’m so excited to say we officially love and have a lot of fun with tummy-time. I think in the next couple of months tummy-time is about to morph into crawling. His arms are getting so strong! I can’t wait for him to start crawling. I know, however, this will be a game-changer. Baby-proofing here we come! John had his week of vacation and we went to Turks and Caicos with my family. 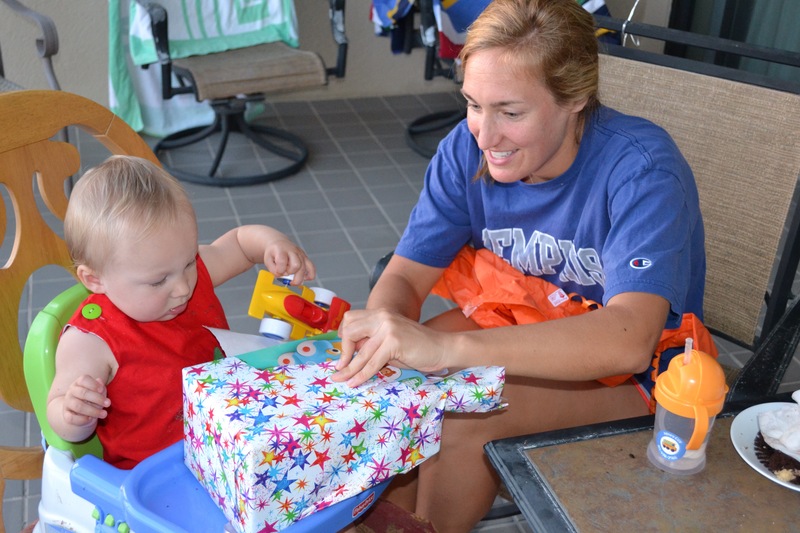 It was so fun to be in warm, tropical weather and to spend time with grandparents and Aunt Libby. Most of all it was fun to have John with us all the time for a whole week. He works so hard and deserved such a relaxing week. We had a blast! Henry even took a nap on the beach! John and I also enjoyed a date night. It was so nice to have uninterrupted time together! Yesterday was John’s birthday! He had the day off so we had lots of fun relaxing and spending time as a family. We ate some pretty good food too! We started with French toast for breakfast. After church we ate at Fig and Honey, one of our favorite spots for lunch. And we enjoyed a delicious dinner of pork chops, mashed potatoes, and broccoli (as requested by the birthday boy). To top it off we had Carrot Cake for dessert. John and I always make carrot cake for one another on our birthdays. We use John’s mom’s recipe, and boy is it delicious! Henry and I are so blessed to have John in our lives. He cares for and loves us both so well. He is SUCH a good, loving, and fun dad and husband. We love you, John! We had lots of fun with our friends Caleb and Maya for dinner this week. Sharing a meal with friends is one of our very favorite things to do. I made burrito bowls and we enjoyed them with salad, chips and guac, and beer. The key to a good burrito bowl, in my opinion, is good chicken. I marinated my chicken in lime juice for about an hour and then rubbed it with spices before cooking. I had bowls with the toppings of: of sautéed peppers and onions, pico de gallo (that I bought from Lowe’s foods), black beans (see recipe below), and cheese. We put everything over Spanish rice. I think it was a hit! Marinate Chicken in limejuice for about an hour. Combine spices and cover chicken. Sautee over medium heat in skillet until cooked (about 8-10 minutes). Combine all ingredients in medium saucepan and bring to a boil. Reduce to simmer, cover, and cook for about 15 minutes (or until onion is cooked). We are headed out of town today for a week of relaxing and together-ness at the beach. I can’t wait! This guy will officially be 5 months this week! I can’t believe it! I have been trying to write this post since Monday morning (for a “Mindfulness Monday” post), but this week has been crazy, so instead this is a “Mindfulness Morning” post. Put my phone/technology down and enjoy the beautiful life I am living. Focusing on breathing is another part of mindfulness. Taking a deep, cleansing breath is so important in times of stress. I am going to work on taking that breath and using it to focus on what I am thankful for at that very moment. 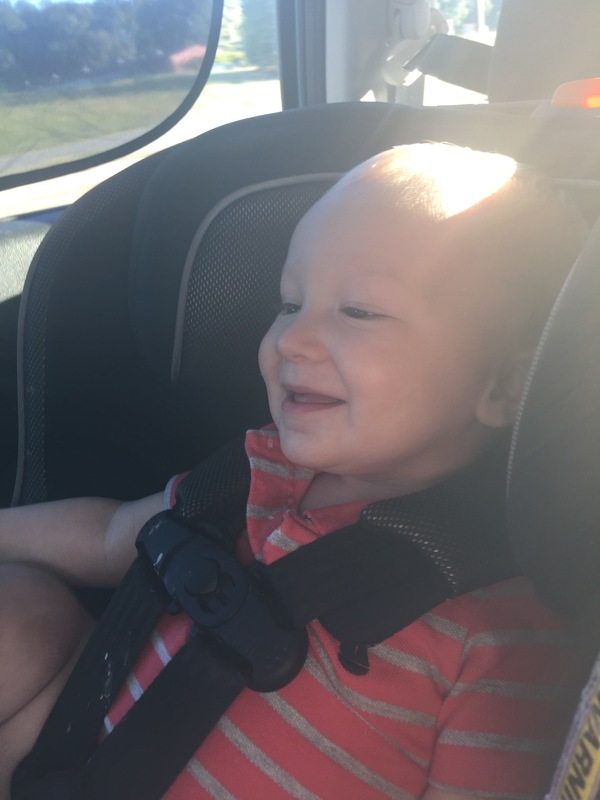 For example, when Henry has a meltdown in the car: instead of driving like a maniac to get home, I am going to try to remember to take a deep breath and be thankful we got out of the house to have some fun! Having a quiet time each day to focus on thankfulness. This is something I have gotten out of the habit of lately. I am constantly asking the Lord for things. He has given me so much to be thankful for, and I want to remember to take time each day to thank and praise him for that. I am excited to practice these three small things this week! His new jumperoo. Endless entertainment for every Eick! We finally bought and enjoyed Little Blue Truck Leads the Way. His size three diapers arrived. How is time flying by so fast? Beeeeeautiful weather here in Chapel Hill meant we spent lots of time outside on walks or just hanging out on the front porch! Tonight we are having some good friends over for dinner and I am making burrito bowls! They are so easy and are always a crowd pleaser. I’ll post the recipe tomorrow. Whew! I can’t believe it has been two weeks since my last post. Time really flies! The past couple of weeks have been a mixed bag. We have had some super fantastic days and some tough days. Henry got sick for the first time-no fun. Thankfully, he is on the mend. Instead of dwelling on the tough stuff, I’m going to focus on all the fun things we have been doing lately! We have had some quality time with John! As I have said many times, Henry loves his Dad so much. This month John will be on consults (aka he gets weekends off) AND he has his one week vacation coming up in March. Can I get a round of applause?! It may time for bed, but Daddy’s home so let’s play! I have been jogging more consistently. What a difference regular exercise/endorphins can make! I have joined a training group for a race this in Chapel Hill. It has been fun to have accountability and other people to run with. I have been intentionally taking some time to relax. One way I have been doing this lately is to try to have D.E.A.R. (Drop Everything And Read) time during one of Henry’s naps. I am currently reading Mr. Penumbra’s 24-Hour Book Store by Robin Sloan. It is a really fun book and is one that totally takes me away each time I read it. An added bonus is that the cover glows in the dark! Henry is now big enough to be front-facing in our ergo carrier. He stays entertained for longer, meaning I can get more done around the house. Victory! I have been enjoying Lucy. Since having Henry, Lucy has sometimes been an added stressor. I have felt guilty for being easily annoyed by her. But taking care of Henry has felt so overwhelming at times that I have not had any energy left to play with Lucy. Lately, however, Henry has been absolutely obsessed with her. He watches her every move and LOVES it when she licks his face and hands. His love for her has helped me remember all the great things about our sweet pup. Thanks Henry! Please notice the tummy time occurring in each of these pictures. Way to go Henry! Sometimes taking a moment to focus on (and write down) the positive things in life can help us maintain a good attitude. Isn’t that wonderful? Today, we have Kindermusik, we are hoping to go for a jog if the rain will hold out, and tonight we have small group. I’m thinking about making Skinnytaste’s Minestrone soup for dinner. Henry is officially 4 months as of Monday! He just keeps getting more and more fun. His little personality is shining through even more than it was just a month ago. He is one cool kid! Henry is curious. Henry has awakened to the world around him. I love watching him get excited around other babies or when we go outside. He loves looking at new things. Henry’s happy squeals make my heart burst. When he gets really excited he lets out a shrill squeal of delight. It makes me SO happy! Henry puts everything in his mouth. It seems like only yesterday that we were excited because he was looking at and tracking dangling toys. Now he is grabbing them so he can chew on them. Henry loves his toys. Within the past month he has learned how to hold, play with, and chew on his toys. It is so fun to watch him entertain himself. He loves his Nuby Keys and Stella the bunny! Henry loves the changing table. He is always so playful and happy on the changing table. Henry loves his high chair. He is so entertained by playing with his toys on the tray, and being up high so he can look around! Henry loves his dad. There is nothing better than watching Henry’s face light up when John walks through the door. Tummy time. Will this boy ever find tummy-time enjoyable? Naps without being swaddled. We are currently one arm swaddled, one arm free. Hopefully we will be completely unswaddled by next month! Eating with a spoon. We are having so much fun practicing eating. Right now, Henry is just eating rice cereal, but it will be fun to introduce him to different foods over the next month! Currently, most food ends up on his bib. Hair. The boy is balding. But he is also growing tiny, blonde, new hair. Someday he will have a nice full head of blonde hair.